Centrally located in Kolkata’s business district, New Kenilworth Hotel offers a blend of modern and colonial architecture. Providing free parking, it features a spa, fitness center and 4 dining options. Hotel New Kenilworth it is a 10-minute walk from Maidan subway station. Netaji Subhash Chandra Bose International Airport is 16 miles from the hotel. 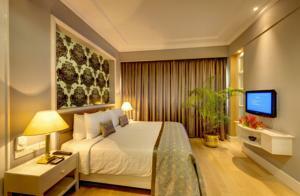 Featuring classic furnishings, air conditioned rooms are equipped with a satellite TV, safe and a minibar. Spacious bathrooms have a bathtub and heated shower facilities. Guests at the New Kenilworth can pamper themselves at the beauty parlor, or relax in the steam bath. The staff can provide car rental services and assist with travel arrangements. The Marble Room serves traditional local dishes. The hotel also houses a 24-hour coffee shop and an English-style pub with a pool table. Wi-Fi is available in public areas and costs INR 487.53 per hour. Free! All children under 6 years stay free of charge when using existing beds. Free! One child under 2 years stays free of charge in a baby beds. All older children or adults are charged INR 1650 per person per night for extra beds. The maximum number of extra beds/baby beds in a room is 1. Any type of extra bed or crib is upon request and needs to be confirmed by management. Additional fees are not calculated automatically in the total cost and will have to be paid for separately during your stay.